Since I was thrown atop a horse as an infant, I have adored them. I have my favorite particular breeds, colorations and individuals, but all in all, I love all horses. Their faces, their musculature, their personalities, their speed, their spirit, and the world wide, American and Native American history of the horse speaks to me in a profound way. The horse is a godsend. Wheels on legs. And horses can be as close to a person as any pet friend. Horses whisper something special to me. 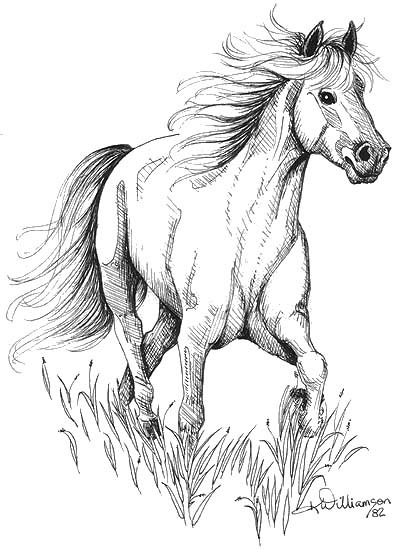 My first friend horse that I remember was named Buckskin, and she was named for her look: the classic tan body with the dark mane and tail. She had a handsome son named Jimmy. He was taller, faster and a lovely rich chocolate color with black mane and tail. Before I began first grade, that first summer my older brother and I spent on our paternal grandparents’ ranch style farm (sans parents), my brother would always go for Jimmy and I was content to stick with my dear Buckskin. At least as she aged, my beloved Buckskin was a naughty old lady at times. She would buck everyone off if more than two children were ever placed upon her back. Why were more than one child ever put up on her? I will never know, but I was bucked off Buckskin at least twice and landed on my head once that I recall. I always forgave that stubborn horse and got right back on, and I cried when I knew that she was gone off to horse Heaven. When I was a kid, I had this sketch up in my room! I love this picture! Thanks for the nice comment! Glad you enjoyed it.